Paul is convinced because of Christ’s sacrifice the Christian is free, they have liberty. The Christian is free from guilt of sin because we have experienced God’s gift of forgiveness. We are free from the penalty of sin because Christ died for us on the cross. And since Jesus sent us the Spirit we are free from the power of sin in our daily life. This is God’s promise in a new covenant which Jesus fulfilled. In the old covenant the people did not have the same freedom. In fact there were many laws that needed to be followed in order to be obedient to God’s wishes. For God, obedience was an expression of faithfulness and submission. Jesus is clear he has not come to replace the law but to fulfill it. 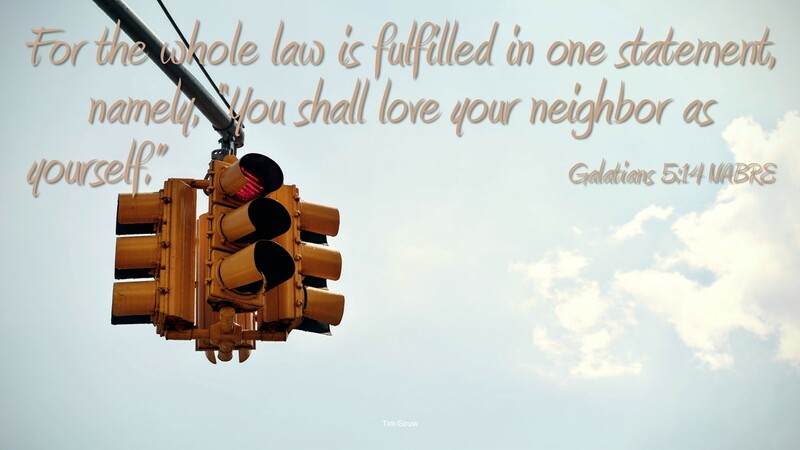 Paul is telling us, in the new covenant we are asked to love one another, to love our neighbor. This love is enough to fulfill the law. If you love your neighbor you will not steal from them, lie about them, envy them, or try in away way to hurt them. Because Jesus asks us to love God we will keep His name holy, honor His word and demonstrate His worthiness through our worship. It is love that takes place of all the laws ever given. Love is the heart of God’s substitute for laws. God used the law to guide us into God’s presence and to make us aware of the one true God. Jesus’ life is a fulfilling of the law by teaching us we are loved and that we should express love for God and others. Jesus’ sacrifice forgives us, restores our eternal relationship with God and asks us to sacrifice for others. We must be an expression of Christ’s love for us to others. By being love, we fulfill all the law ever written. Love is simple to understand though not simple to do. How do you express love? How do you show love for God?